Bundle-up and listen to those sleigh bells as you glide through Vermont's wintry landscape. When the snow begins to blanket the landscape, Hawk will gladly satisfy your equestrian needs with a magical ride through the winter wonderland. Bundle-up underneath a cozy blanket, bring along a cup of hot chocolate from the farmhouse, and Hawk will take you through the Vermont countryside in an old-fashioned sleigh pulled by specially-trained, high-stepping Belgian draft horses. Following a revolutionary-era British military road through the woods, the sleigh will introduce you to some areas of the resort that may otherwise escape your attention on foot. All the romance of winter in Vermont is epitomized in a horse-drawn sleigh ride - which is probably why it remains one of the most popular wintertime recreational attractions at Hawk. Horse-drawn sleigh rides are offered seven days a week during the holiday period and on weekends throughout the winter season. Reservations are required. 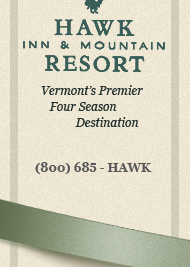 For further information, or to make reservations, please call the Hawk Farmhouse Reception Center at (802) 672-3811.